The barrettes work because the pick is curved. The forging makes it springy. The pick is used like a scoop; once the pick is through the other side, turn it over to lock it in place. We make sure you have the right size for your hair. Again, size counts! Extra Picks are available for $2.00. 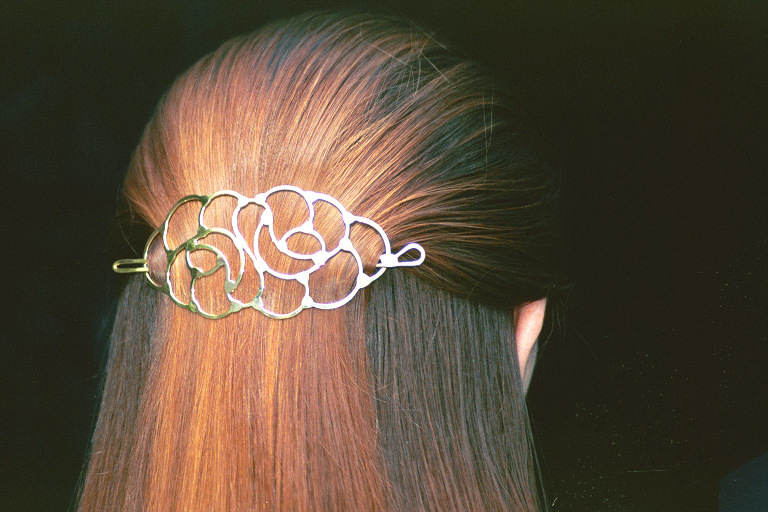 All of the larger fancy barrettes come with the heavier picks. If you have one of the older larger barrettes witha thin pick, and your pick no longer holds, call me and I'll send you an extra heavy one. If you'd like to buy an extra heavy one, they're $7. As always, if you manage to break one of my pieces short of deliberate destruction, I will replace it. This includes the picks. They take a LOT of abuse and sometimes they just wear out. I'm happy to replace those. If you're not sure of the size, just snap a picture next to a ruler, and e-mail it to me. I'll be happy to send you a new one. Fancy Barrettes are one of a kind and come in several styles. Because of the added width and the additional height in the dome, it can be difficult to predict how much hair they will hold, which is why I prefer to sell the larger fancy ones in person. If you already have one and can measure its width and dome height, great! If know your general size, give me a call and I'll let you know what I've got on hand. I'll be happy to take digital pictures of the one(s) you're interested in and e-mail them to you, along with price info. Because fancy barrettes vary widely in size and style, these photos are indicative of the general style, not the specific barrette.